CPP Peptide Synthesis: Make Your Peptide Cell Permeable! How to Make Your Peptide Cell Permeable? Read more: A full list of cell penetration peptides. Your peptide will be conjugated to the Cys(Npys)-(Arg)9. The peptide is synthesized with an activated cysteine residue C(Npys). The 3-nitro-2-pyridinesulfenyl (Npys) is a novel selective protecting group which can be activated for peptide bond formation. The S(Npys) group of this cysteine-containing R9 peptide can selectively react with the free thiol group of your cysteine-containing peptide. They will form an unsymmetrical disulfide bond. The final conjugate will effectively deliver the target peptide into cells and then release the therapeutics such as siRNA or your target peptide in the reducing environment. This conjugation will make your peptide cell permeable. Ask a quote to make your peptide cell permeable now! The process of introducing drugs into cells has always proved a major challenge for scientists. However, cell-permeable peptides (CPPs) have the ability to enter the plasma membrane of a cell independent of a membrane receptor. They are usually small peptides 10–30 residues in length with positively charged amino acid sequences. 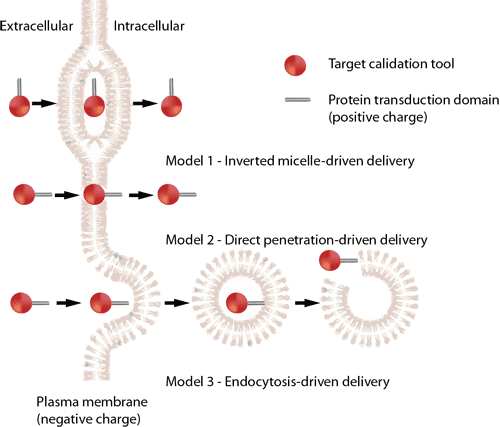 CPPs are capable of delivering biologically active cargo to the cell interior. 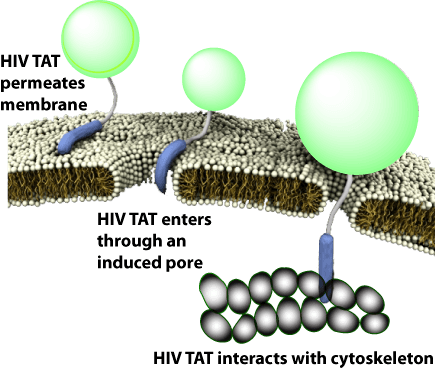 The desired therapeutic cargo could be attached to a CPP and then delivered to an intracellular target, thereby overcoming the entry restrictions set by the plasma membrane. CPPs have gained a widespread popularity as very promising non-viral transmembrane delivery vectors. Although they have been used successfully for carrying different cargoes of varying size and nature (plasmid DNA, peptides, proteins, nanoparticles, and quantum dots, etc. ), the most rapid progress has been made with the delivery of oligonucleotides (ONs). CPP-based cellular delivery vectors have enabled the introduction of a non-covalent strategy for associating ONs with carriers by simple mixing. However, the peptide sequence needs to be tuned carefully to that of both the cargo and application. For example, a stearylated poly-arginine peptide: Stearyl-R8: st-RRRRRRRR-NH2 was effective with a larger plasmid. In contrast, larger plasmids were ineffective for the cellular delivery of a splice-correcting oligonucleotide. Example: To achieve MPG-mediated gene delivery, complexes of the peptide carrier and DNA, 500 ml of either DMEM or was mixed with 100 ng of DNA complexed with MPG at a charge ratio of 5:1. The samples were incubated at 37°C for 30 min, and then added to cells at 60% confluence. Click this review paper from Nature to learn more about different peptide-mediated delivery systems. Many novel CPPs have been used to effectively transfect a variety of cell types to elicit specific biological responses. For example, they were used to challenge primary and suspension cells without exerting cytotoxic effect. In addition, CPP-mediated ONs could inhibit tumor growth effectively in tumor-bearing mice in vivo, without triggering the immune response. Therefore, CPP–ON complexes have significant therapeutic potential. The cysteamide stabilises the DNA-carrier complexes. Order this cell permeable peptide now! It can selectively react with the free thiol group of your cysteine-containing peptide. Polyarginine peptides have been efficiently used for siRNA delivery into cells. Stearyl-R8 can lead nucleic acids through cell membranes. There is no need of covalently attachment between the nucleic acid and the multiple arginine peptide. Model 1: The inverted micelle model. Model 2: The direct penetration (pore formation) mechanism. Model 3: An endocytic mechanism of uptake. Source: Cell-permeable peptides and their therapeutic applications, Victoria Sebbage, BioscienceHorizons, Volume 2, Number 1, March 2009. Arg or Lys-rich CPPs have been used widely for gene targeting. The stearly-RRRRRRRR-amide can be spaced using aminohexanoyl (Ahx) to enhance hydrophobicity and proteolytic resistance in serum. Adding a fatty acid to the Argnine rich peptides will enhance delivery of the peptide nucleic acid conjugate. Click this review paper from Nature to learn more about the strategies for peptide-mediated delivery. Since the discovery of Tat, the number of known peptides with cell-permeable capabilities has grown. The following table shows some examples of currently known CPPs, together with their origins and sequences. Some peptides are hydrophilic containing arginine and lysine. The examples are penetratin and TAT. Some cell permeable peptides are ampliphilic. This kind of peptides are rich in lysine amino acids. A typical example is the beta amyloid protein. The amyloid proteins form antiparallel beta sheets which are strongly ampliphilic. The sheets aggregate to form toxic oxidative fibrils. CPPs, including the HIV TAT peptides, can enter cells via internalization pathways such as direct translocation and endocytosis. HIV TAT peptide or poly-arginine-containing peptides could be designed and utilized in drug delivery systems. However it is unclear how CPPs achieve efficient cellular molecular transportation. How does HIV TAT peptide facilitate direct translocation and endocytosis? Experiments performed in the laboratory of Gerard Wong’s lab demonstrated that HIV TAT peptides could interact with several intracellular components, including the cell membrane, cell surface receptors, and the actin cytoskeleton. These interactions result in various translocation pathways under different conditions. Interestingly, the same sequence within TAT peptide can interact with different cellular components, including the plasma membrane, or the actin cytoskeleton to activate different translocation pathways under a variety of conditions. The entry mechanisms of cell permeable peptide depend on their amino acid sequence. Adding one hydrophobic amino acid to a highly hydrophilic cell permeable peptide sequence could significantly change the penetration mechanism. For example, the polyarginine RRRRRRRR could induce the formation of a cell membrane pore. The arginine creates positive and negative curvatures at the same time. However lysine creates only negative curvature in a single direction. So a peptide with arginine residues and lysine or hydrophobic amino acids could function differently. TAT peptide can mediate endocytosis both with and without receptors. CPPs use less hydrophobic amino acids to create curvature in the membrane. High levels of hydrophobicity generate negative Gaussian curvature.